As summer dwindles, we are ushering in autumn this week with some opportunities to get out and about in the city of Asheville. Experience the refreshing beauty of the crisp fall days while enjoying the best of what Asheville has to offer in restaurants, concerts, art events, museums, festivals, nightlife, outdoor adventure, and more. Friday, September 21 is the last chance this season to come to the 100 block of North Lexington Avenue for the final Downtown After Five Concert Series event. 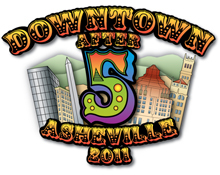 From 5-9p.m., enjoy free live music and entertainment set against the backdrop of downtown Asheville. Closing night performances feature The Black Lillies hailing from Knoxville, Tennessee and local opener The Buchanan Boys. You'll find a nice blend of country, blues, roots, and countrified rock-and-roll. Live performances begin right at 5p.m., so don't miss out on a minute of the music. Admission to this event is free, but $2 wristbands for beer and wine along with a valid photo ID are required for alcohol purchase. Local brews from Highland, Pisgah, Asheville, and French Broad brewing companies are on-hand to help quench your thirst. Regional favorites are represented including Sierra Nevada, Sweet Water, and Magic Hat brewing companies. Let's not forget national brands such as Budweiser and Empire Distributing are on tap as well. Not into brews? Wine and water are also available. Food vendors are in attendance offering a range of items including tacos, pizza, and ice cream. The concert series is committed to reducing its carbon footprint whenever possible and that is evident through the use of biodegradable food and beverage containers, staffed compost, and recycling stations. So please help them do their part by doing your part. Please properly dispose of trash in its appropriate places. Speaking of musical performances, another not-to-miss music event is the Asheville Area Piano Forum's 12th Annual Fall Benefit Concert occurring at the Diana Wortham Theatre at Pack Place in downtown Asheville. The concert is held on Sunday, September 23 from 3-5p.m. It's a wonderful opportunity to sit back, relax, and enjoy 20 professional and guest artists as they perform and present you with an afternoon of solo, two-piano, and ensemble music for your listening pleasure. Musical genres include the classics, jazz, and African-American spirituals. Proceeds benefit the Forum's educational and charitable activities. Adult admission is $28. This year's concert is in memory of Paul Mark Thorpe. Make the most of your Asheville visit by staying for a while. Let's face it, you need time to see and do all of the things that you want to while you're here. 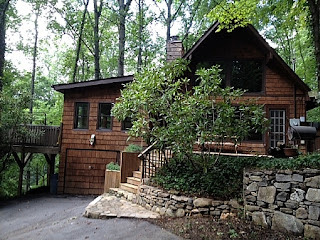 Whether you're looking for luxury, romance, proximity to downtown, or a mountain cabin getaway?it's all right here. Tell your friends! Have you been to Asheville during the fall season? What is your favorite thing about Western North Carolina this time of year? Please share your thoughts and experiences with us. We always love hearing your input. Happy Autumn!